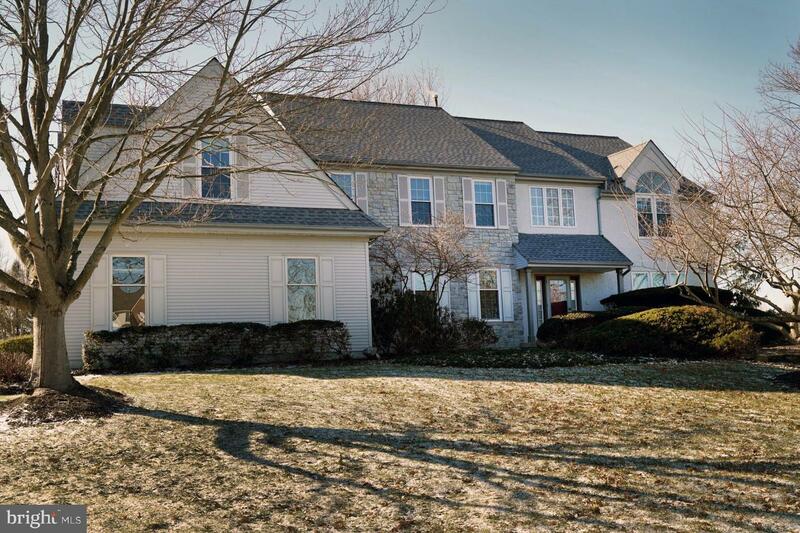 A rare find is this gracious 4,100 square foot NORTHEAST facing home in the intimate Kings Point East community so convenient to the McCaffrey~s Shopping Center, Rt. 571 and Community Park! Calton Homes built very few of this Monroe model in West Windsor and it is the ideal layout with both a first floor guest/cabana room as well as a home office and additional bonus or game room over the garage. Beautifully elevated on the lot, you will find a house whose well maintained exterior only hints at the pristine condition to be found inside. A covered entry way leads to the two story foyer with rich Brazilian teak floors that continue into the banquet sized Dining Room warmly welcoming guests. Opposite is the formal Living Room that has French Doors leading to a quiet home office so desirable for the work from home lifestyle. The back of the house looks out into acres of open space for maximum privacy and is the perfect setting for the open concept custom kitchen and family room. The sunny, remodeled kitchen delights even the most sophisticated of cooks with cherry cabinetry, ceramic tiled floor, pantry, granite counters, stainless steel appliances that include a wine fridge and large two-level center island. The 13 x 11 Breakfast area has a slider for access to the low maintenance multi level Trex~ deck and the gorgeous views and sunsets in the backyard. This kitchen opens into a step down family room with cathedral ceiling and fireplace. A FIRST FLOOR bedroom and adjacent full bathroom round out the main level while offering an additional, 31 x 16 foot bonus room over the 3 car garage with a separate staircase. Imagine a second home office, a game room or additional guest room as it is virtually apartment sized and has a closet for storage! The bedroom level is unusual in that all the rooms are beautifully proportioned with the smallest measuring 13 x 14. The master suite has wonderful angles with a cathedral ceiling, half moon palladium window, double walk-in closets and an adjoining bathroom with dual sinks, separate commode, soaking tub and tiled shower. The huge finished basement with high ceilings adds almost another 1,500 square feet of living space with a room that would work well as a theater room and another large, open space for entertaining. Recent updates include a fully inspected septic system with new Distribution Box (January 2019), much fresh carpeting and painting and quartz counters in the master bath. 3 Zone HVAC with damper for a 4th zone (two replaced furnaces and one A/C 2010), Roof (2015) A beautifully maintained home that shows real pride of ownership should be at the top of your list! !